FUTURES – Market commentary: Updated Trading Plan for the S&P500 ES e-mini futures (watch an example here) — I will use SPY ETF due to data issue on my trading platform. STOCKS – Stock analysis: Research in Motion (BBRY). If you miss the videos on the Euro FX currency futures I publish in the Blog every day throughout all the week, you can now catch up in the Mid-Week Update. 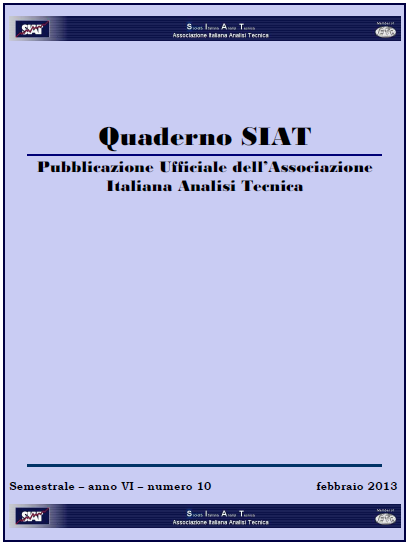 I do every effort to offer newsletter content in both English and Italian languages, but at the moment I can only record and write the Mid-Week updates in English language, so I ask the Italian readers and friends to be patient. Anyway, with time I intend to make available the most important content in both languages. I send my free Newsletter on Sundays along with other information. The newsletter typically includes: a weekly review for the Dollar Index, the Euro-Dollar cross and the S&P 500 e-mini futures, my FibStalker View on Currencies focusing on the Dollar Index, the Pound (GBP/USD), the Australian Dollar (AUD/USD), the Canadian Dollar (USD/CAD) and the Japanese Yen (USD/JPY), articles on my trading method, market commentaries and HFT/Program Trading, from which I derive my trading edge. 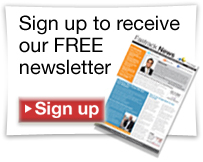 Please, register here to receive the free weekly newsletter. Yesterday evening the Euro FX pierced the 1.3276 level that we were closely watching and that decreed the opportunity of a larger move into the 1.2900 area. Indeed, the market continue lower and the selling resumed during the Asian session. The Euro also hit the first target in the 1.3270 area and is now headed into the 1.3130, where we could get a bounce. The plan is the same as yesterday (see above picture). If the relative lows are in at the 1.3474 level (due to an inner traditional move) we could see a retrace into the 1.3240 to 1.3300 area before the move lower can resume. 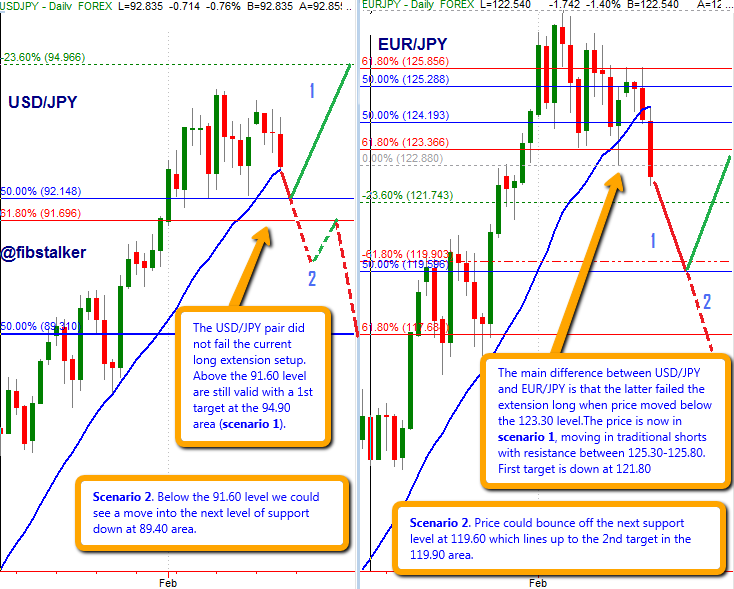 The target is now confirmed at 1.2900 and it is just a matter of how and when price can get there. This could happen in the coming two weeks. The 1.3530 area of resistance and short selling never traded (too big of a front-run), but program trading participation has evidently pushed price lower (see picture below). The 1.3540 area of setup has targets in the 1.3270 area (1st target) and the 1.3130 area (2nd target). 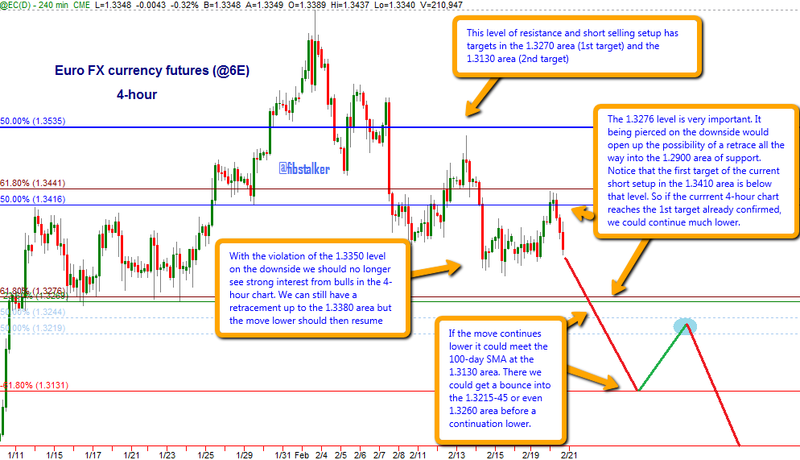 The 1.3276 level is a very important level to monitor. It being pierced on the downside would open up the possibility of a retrace all the way into the 1.2900 area of support, which I have been now anticipating since some time (find the reason in Feb 8th video). Notice that the first target of the current short setup in the 4-hour timeframe in the 1.3410 area is below that 1.3276 level. So if the current setup in the 4-hour chart reaches the already confirmed 1st target, we could continue much lower (into 1.2900). With the violation of the 1.3350 level on the downside we should no longer see strong interest from bulls in the 4-hour timeframe. However we could still see a retrace onto the 1.3360-90 area. We can still have a retrace up to the 1.3380 area but the move lower should then resume. If the move continues lower it could meet the 100-day SMA at the 1.3130 area. There we could get a bounce into the 1.3215-45 or even 1.3260 area before a continuation lower into the 1.29s.